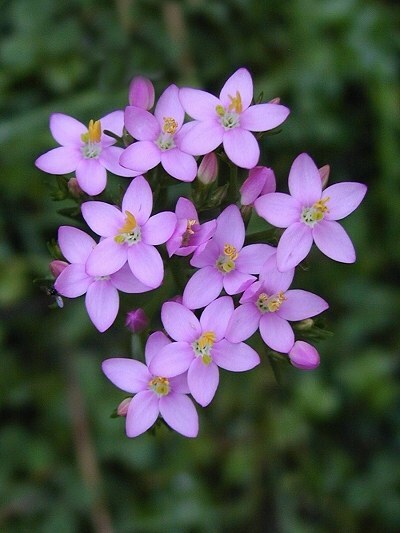 Description: The Centaury is an annual or biennial herb, growing up from 4 inches to 16 inches. It belongs to the Gentian Family - Gentianaceae. The plant requires well-drained soil and grows on light (sandy) or medium (loamy) soils, and can even grow in nutritionally poor soil. It is often found growing in patches in sheltered low-lying inland areas near freshwater ponds. It is in flower from June to October, but only on very clear, sunny days. The seeds ripen from August to October. The scented flowers are hermaphrodite (have both male and female organs) and are pollinated by Bees, flies and beetles. The plant is self-fertile. Centaury contains many bitter substances and is used as a flavouring in bitter herbal liqueurs and is an ingredient of vermouth. One cannot say no, weakness of the own will, an overreaction to other peopleÂ´s wishes. One has a weakly developed personality and an insufficient assertiveness.